It has been a spectacular if short sequence of events. First came a flurry of indictments in the US against 12 Russian intelligence operatives, ostensibly on claims that they had tampered with the US political process. With that news niggling him, US President Donald Trump repaired to Helsinki for his first official meeting with Russian President Vladimir Putin. They then met with the smallest of entourages and a degree of informality, prompting the former CIA director John Brennan to wonder what might have been concealed from close advisors, not to mention 'the American public'. Then came the joint press conference that sent press corps, commentators and representatives into an apoplectic meltdown. Trump, showing his traditional hostility to the US intelligence community, warmed to the account of the Russian president rejecting accusations that the Kremlin had interfered in the US elections. 'They said they think it's Russia. I have President Putin — he just said it's not Russia.' He also saw no reason why Russia would have been involved. Democrats and a clutch of high ranking members of the GOP were far from amused by the antics in Helsinki. Former House speaker, Newt Gingrich deemed it 'the most serious mistake of his presidency' which needed immediate correction. Brennan's assessment was graver, suggesting that Trump's words had exceeded 'the threshold of "high crimes and misdemeanours"'. Such conduct was 'nothing short of treasonous'. Senator minority leader Chuck Schumer considered the incident an ignominious and singular chapter in the annals of presidential history: 'In the entire history of our country, Americans have never seen a president of the United States support an American adversary the way President Trump has supported President Putin.' Siding with Putin 'against American law enforcement, American defence officials, and American intelligence agencies is thoughtless, dangerous and weak'. "Trump did not bite. The status quo, icily cool, remains." There are a few narratives that are conveniently conflated in the tangle that is Kremlin-White House relations. One is that of electoral collusion between Trump, his campaign circle, and the Kremlin that supposedly took place in 2016. This is the focus of the investigation by special counsel Robert Mueller III, a process Trump has openly declared to be a 'rigged witch hunt'. Then comes the issue of Russian political interference, which has become the fashionable orthodoxy in Washington. Trump's ripostes, couched in the language of 'fake news', tend to focus on the Mueller investigation rather than the broader allegation of Kremlin cyber fiddling. The Helsinki meeting enabled Putin to have a persuasive word to his US counterpart to confute the line taken by the US intelligence services. Such gatherings only serve one purpose: to feed the display of power and displace reality. In truth (dangerous word to use these days), the Helsinki gathering was treated with an unwarranted, even pathological seriousness that gave it a credence it never deserved. The entire spectacle was aptly decoded by Masha Gissen of The New Yorker, who argues that both men have a distinct 'understanding of power: the triumph of nothing over everyone.' Power comes before governance. For the Kremlin, the meeting only mattered because it was taking place. The agenda was hardly of consequence. Besides, reasoned Gissen in typically strident fashion, we will never know what was actually said, both men being 'habitual liars'. Importantly, the unhinged indignation towards the Helsinki gathering ignores the fundamental fact that the meeting of the two had no constructive, let alone destructive effect. In place was a surreal show: Putin, for instance, proposing that, should Trump allow Russian law enforcement officials to interview billionaire Bill Browder, he would allow Mueller to investigate the 12 indicted intelligence officers. Browder is of particular interest to Putin, having allegedly evaded taxes earned in Russia to the tune of $1.5 billion, but he is also the architect of the Magnitsky Act which sanctions and bars Russian officials for claimed human rights abuses. Trump did not bite. The status quo, icily cool, remains. Nor did the president give any indication of altering US policy towards Russia's annexation of Crimea in 2014, or Washington's supportive stance to the beleaguered Ukrainian government. Putin continued his support of the Iran nuclear deal, while Trump remained uninterested in returning to it. If these were, indeed, the first steps towards a new vision of Russian-US relations, they were stutters rather than strides. The Trump show remains one hatched in a television studio, scripted in the manner of the reality television that he made so infamous. The product is lodged in the realm of the unreal, while substance barely matters. Both men did what they do best: fomenting theatrical chaos in the absence of substance. Significantly, they had a vast, vocal audience that fell for it. 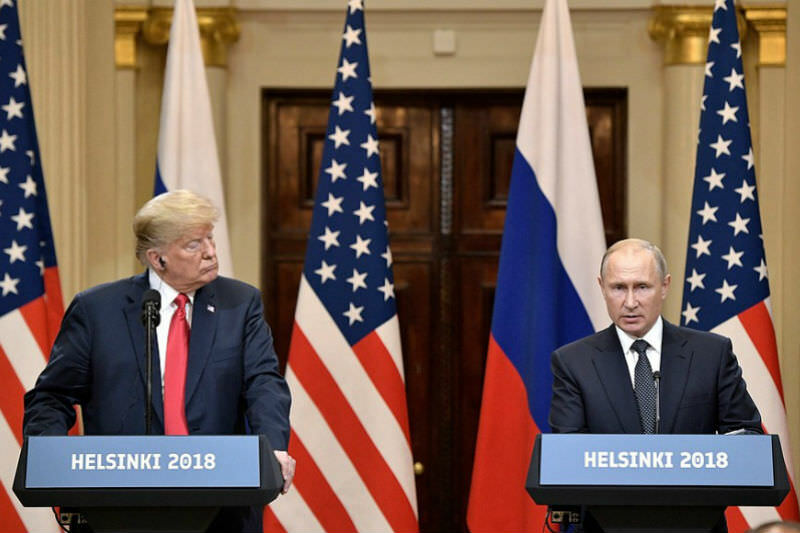 Trump fumbled his speech at Helsinki and thus gave his opponents ammunition, and it is unsurprising that an arch-enemy like ex-CIA Director John Brennan should take aim and blast his conduct as “nothing short of treasonous.” This is the same Obama-appointee John Brennan that David Harsanyi of The Federalist called “a liar”; Trevor Timms of The Guardian called “the most talented liar in Washington”; and author Rich Welsh said “Actually, he’s a lying scumbag.” It’s also the same Brennan who, at the height of the Cold War, voted for Gus Hall of the Communist Party of the USA, and who was never able to find any Reds Under the Bed of any radicals, until he came across Donald Trump. “Trump did not bite. The status quo, icily cool, remains.” Putin went out of his way to meet Trump, who was essentially on a European vacation, to get nothing. That sounds like your making an hour's trip to the airport to meet someone in the transit lounge for some inconsequential chit-chat because you have to. Meanwhile, at re-election time, the canny Manhattan businessman can show everyone that he is the good guy prepared to talk to anybody for the sake of peace without giving away the farm. The Iranians might be next for this piece of cheek. I wonder if they’ll fall for the trick. Or feel they have to. Ross Howard may be a bit harsh (to put it mildly) in his attack on John Brennan. The ABC reported today that in a letter to the President published in the Washington Post, retired Admiral William McRaven called this same Mr Brennan "one of the finest public servants I have ever known". The Admiral further wrote "I would consider it an honour if you would revoke my security clearance as well, so I can add my name to the list of men and women who have spoken up against your presidency." Admiral Brennan oversaw the raid that “got” Osama bin Laden. Just want to add a bit of balance. For what it’s worth, I doubt Trump fumbled his speech at all. It would be consistent of him not to say anything that would challenge Putin’s story, at least until he was not in the same room as Putin. "Admiral Brennan" should of course have read McRaven. Just want to correct the record before the pedants get me.